30 years ago, the landscape of personal computing was vastly different. It hardly even existed, compared to what it is today. 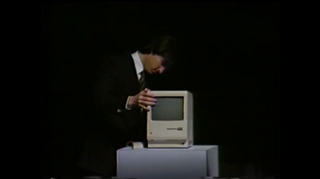 Footage of the Mac's initial unveil is out there, but this second, more polished run—a presentation for the Boston Computer Society—hasn't been available since the event itself back on January 30th 1984. The content of the presentation is largely the same, but the execution has a whole different kind of swagger. Besides these were users, not just shareholders. And, in a way, it sorta feels like Jobs' last public presentation.